As the new year starts up it is usually the time that everyone starts thinking about New Year’s resolutions. I have often made numerous resolutions in years past only to break them in the first week. It seems like the more I make the quicker I break them. The problem with resolutions is they are often vague and usually just an idea not a written goal. I have a thesis that I am working on. It goes like this. Each month of this year develop one new habit. Make it simple and doable. At the end of each month decide on a new “habit” for the next month and continue doing the existing habit. At the end of the year 12 habits will be developed. All of these habits will be written down and be simple enough that I can verify if they have been done. Experts say that most actions take at least 21 days to become “habits” so a month should be ample time for it to become routine. I started this thesis back in October. My first habit was to drink at least 2 quarts of water per day. This is a pretty simple habit but it did take some planning to accomplish. I had to make sure I had a way to measure the water I was drinking and that I had a good source of water that I could take with me in the car and to work. I decided that 1 liter bottles of drinking water would do the trick. I bought a case of them from Costco and took some to work with me. It’s real easy to see if the goal has been accomplished as I will have 2 empty bottles at the end of the day. Even though this was an easy goal it took verification to keep me on track. The regimentation of the work week made the goal reasonably easy to follow during the week, but weekends tended to be a problem. It is the “change” of schedule that throws things off. I can say that I have been about 80% successful with this goal. It’s real easy to get back on track. November was a new habit. This time it was taking my lunch instead of eating out. This would not be an ultra rigid goal but one that would be practical for most work days. The good part about this habit is cost savings and eating healthier. This goal took preparation and weekly shopping trips to accomplish. This goal has been somewhat harder to maintain but overall I have been successful with it. When my father passed away in mid November I decided would wait until January to start “habit” number three. When something unexpected happens like a death in the family everything gets thrown off and a “normal” schedule becomes impossible. My goal for the month of January is to write a new article at least once a week for this blog. This is a little different than my other habits as it is a weekly task instead of daily. This will take a little different form of verification and I’ll have to decide on a day of the week to review my “habits” to make sure I’m on track. If this habit holds true, I’ll have over 50 additional articles by the end of the year. With my new week starting tomorrow, I’ll now have three habits that I’m responsible for, drinking water, taking my lunch, and preparing an article. I have developed a weekly checklist that I can check off each habit on a daily basis. The weekly habit I will check off on Sunday. By the end of the year I’ll be tracking 12 things. My thought (thesis) is that this will be much more successful than trying to set numerous goals in January and trying to do all of them in a short period of time. 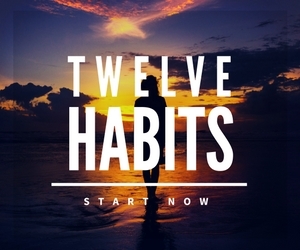 I also think that most of these “habits” will become second nature after a period of time. Time will tell. So far written verification seems to be the key. With this type of thesis many things should be possible. Diet and exercise goals can be broken down into components and developed over time. One month choose to give up sodas. This alone may save 300-400 calories a day. Later in the year make it a habit to have at least 2 pieces of fruit a day. Simple doable things. Travel and recreation goals can be combined in a timeline. A monthly travel and lodging combination sounds great to me. Example… each month make it a habit to travel to a new place and stay at a nice hotel or bed & breakfast. Combine these two “habits” with a photography habit and a journaling habit and the results could be life changing and really fun. Imagine the habit of taking your camera wherever you go and recording people and places. Combine this with a journal of your activities (paste some photos into the journal) and you have history in the making, recording your travels and the people you meet along the way. Do you like a certain type of food? Say you enjoy tacos… how about discovering the best taco place in the town that you stay in. At the end of your year you’ll have a journal full of pictures, stories, and memories of interesting people and wonderful food. Maybe add the habit of corresponding with people you meet along the way by e-mail or snail mail. Sounds like a great book to me… how about writing a chapter a month? 12 habits over the period of a year… it could be a real adventure. 2016 Research Update: The latest research show that it takes an average of 66 days for a habit to stick. This means that each habit will take about 10 weeks. So you could realistically create five new habits in a year. This is much longer than the common 21 days theory presented in the original post. See my post on habit psychology for an update.